'Israelis are Nazis,' 'Netanyahu is Hitler' shouted outside Israeli consulate. Will the groups be prosecuted for incitement? Activists of the Toronto Palestine House marked “Palestinian Political Prisoners' Day” in series of events in front of Israeli consulates and at event halls in Toronto, Canada, over the past week, shouting slogans that incited against Israel. The events included a demonstration in front of the Israeli consulate in Toronto (April 17), a vigil dedicated to Palestinian political prisoners in front of the Israeli consulate (April 18), a panel discussion and a movie screening at the United Steelworkers Hall (April 19) and letter writing night at Beit Zatoun (April 20), according to Alternative Angle. 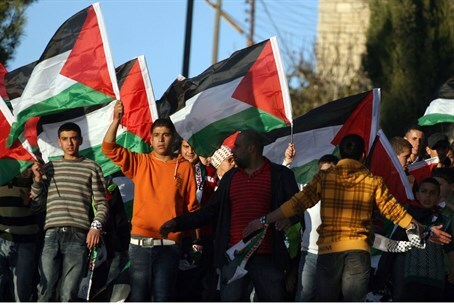 The demonstration was organized with coordination with several pro-Palestinian organizations. They include Beit Zatoun, a cultural and activism center in Toronto purporting “to explore issues of social justice and human rights, both locally and internationally”; Coalition Against Israeli Apartheid (CAIA); Canada Palestine Association (CPA); International Jewish Anti-Zionist Network (IJAN); Independent Jewish Voices (IJV); Not In Our Name (NION); Queers Against Israeli Apartheid (QUAIA); Stop the War Coalition (STWC); United Network for Justice and Peace in Palestine/Israel (UNJPPI); and Women in Solidarity with Palestine (WSP). Demonstrators in front of the Israeli consulate were protesting for the release of all Palestinian Arab terrorists, labeling them “political prisoners” and “our heroes." Several slogans were repeatedly chanted which incited against Israel. Protestors chanted comparisons between Israel and the Nazis, saying “Netanyahu and Hitler are the same; the only difference is the name,"
They then moved on to “Netanyahu you will see, Palestine will be free," “From the river to the sea, Palestine will be free." The pro-Palestinian protestors then chanted “[Gilad] Shalit, Shalit, Shalit" - express support of kidnapping Israelis for political purposes. Elias Hazineh, former President of the Palestine House, added to the chorus of inciting remarks against Israel. Hazineh also handed out to passerby flyers in support of the Palestinian prisoners. The flyers, issued by Justice for Palestinian Prisoners Association Canada (JPPR), regard to ALL Palestinian prisoners in Israeli jails as “political prisoners” - including 476 of them who are serving life sentences and more than 450 who are serving sentence above 20 years. Hazineh has made inflammatory comments against Israel before. In June, he called for genocide against Israel in an Al-Quds day event. "We say get out or you're dead," he added. "We give them two minutes and then we start shooting! And that's the only way they'll understand!" Hazineh's comments caused an uproar worldwide, and sparked furious debate over the freedom of speech in Canada. Avi Benlolo, CEO and President of the Friends of the Simon Weisenthal Center, called for Hazineh to be put on trial for his remarks according to Canada's own anti-incitement laws in a Huffington Post article shortly after the event.